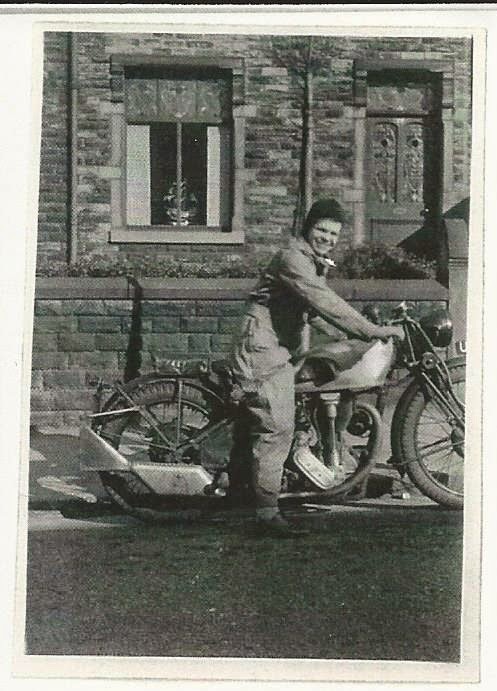 Ron had a motorcycle, and after the war ended, we decided to get it back on the road, in 1947. As the petrol ration was better that year, we did the trip he had promised me So the first thing I had to have was suitable clothing, and on sale at the city ex-RAF store, i found an old flying suit, a one-piece outfit with pockets and zippers. I bought it for 10 bob (shillings) and altered it a little. Then I got some sheet leather to make a riding helmet. It was green and fitted perfectly. Ron had his own pre-war leathers so was OK.
Next day Ron and I were ready to leave. My cousin, Lily and Ron and I were in the kitchen, and Ron shut the door on the dog but the dog was too fast and bit Ron's right hand. So instead of leaving, we went to the hospital. They cleaned his wounds, gave him a shot of something and bandaged his hand, then we set off. As Ron couldn't get his glove on that hand, the wind blew up his sleeve and two days later he had a nasty old. By this time we were near Tintagel in north Cornwall. We walked where King Arthur and the Knights of the round Table lived. What a lot of history here to learn. ...From Grimsby to Huddersfield we had rain, all the way home. The three pannier bags with all our possessions were soaked through. Going through Doncaster, having stopped for lunch, Ron saw a tire for sale and he wanted to get it, but how to carry it home? Could I carry it over my head with one arm through? I said, "Sure, it isn't very heavy," so I did, but by the time we got home is was very heavy, and held a lot of water. We were very wet and glad to finish our trip. When we parked the bike, Ron got off, and I fell off... We had ridden 1600 miles on our trip. MY VIEW #9 - WHAT IS GRATITUDE? MY VIEW (UNNUMBERED) - STORMY WEATHER and WHY?